Since I went gluten-free, at least half a dozen people informed me that I needed to try Risotteria. It was on our list of GF restaurants, and looked like it would be good, but we never made the time. Also, it is located in the West Village, and we just don’t seem to be in that area very often these days. A couple weekends ago, Chris and I took my very good friend Carolyn and her unbearably, make-me-laugh-till-my-stomach-hurts cute daughter to go see The Little Mermaid on Broadway. It was in part a belated birthday gift to the tot as well as a going away present. You see, my two favorite TriBeCa fashionistas will soon be embarking on a southern adventure! Though I will miss them both very much, I am also incredibly excited for them, and now have a wonderful excuse to visit Texas again. After a post-show dinner at our go-to GF joint in the theater district, Nizza (more on that at a future date), Carolyn asked if she could thank us by taking us to dinner as well. “Are there any GF places that you haven’t tried yet?” Many, yes, but I thought of one in particular. 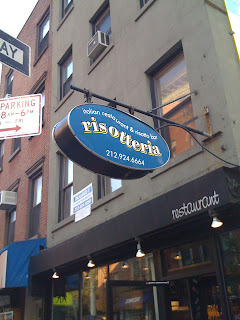 Risotteria. And that’s how we found ourselves, on a Monday night at a quarter to seven, waiting outside this tiny Bleecker Street restaurant for a table among probably ten other people. From the sidewalk we could smell wine and yeast. The menu posted in the window listed over two dozen different types of risotto as well as gluten-free pizza and GF panini. We were hungry, and attempting to kill time with a trip to Murray’s Cheese shop half a block down wasn’t the wisest of decisions–I almost smuggled out a hunk of Havarti with dill…in my mouth. I’m not entirely sure how long we waited for a table, it probably wasn’t much more than half an hour, but I’d gladly wait twice as long next time. To say it was worth the wait would be an understatement. The place is tiny and cute, the drink menus cleverly pasted on empty wine bottles. I immediately noticed that they had GF beer–all the usual suspects (Red Bridge, New Grist, and Bard’s Tale) as well as one I’d never heard of before. We were more in the mood for wine that night, though, and opted for a bottle of light, crisp Pinot Grigio. And not long after we were seated came the breadsticks. Oh my, the breadsticks. Before I took this picture, there were about six in total, all prettily splayed out from the mouth of the glass. I’m surprised I even got this shot. It was an exercise in self-restraint to pause long enough to snap a even couple photos. These breadsticks were unreal. Incredible. Delicious. Amazing. And lots of other incredulous adjectives. They were slightly crisp on the outside and light and soft on the inside, just a bit salty, mildly cheesy (though I really couldn’t tell you if there was actually cheese in them), and a little sticky in your teeth. 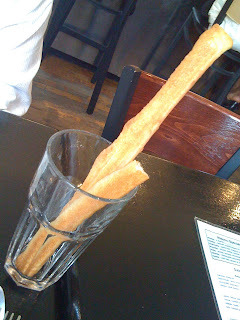 No exaggeration, these breadsticks were the highlight of the meal. At one point, Carolyn suggested that they’d be good for breakfast, dipped in runny egg yolks. Swoon. Throughout dinner, images of casually walking over to the tray where they piled the fresh, warm beauties, snatching up the whole thing, and sprinting down the street laughing devilishly while being chased by a white-aproned chef, shouting and waving a hand towel, drifted through my head. I half-jokingly suggested that maybe next time I’d line my purse with plastic bags and surreptitiously fill it as we ate. Half-jokingly. Oh, I could go on…and on…but the rest of the meal was also very tasty and I should probably give it its due. We gobbled our second glass of breadsticks alongside an order of the meatballs (see remnants above). 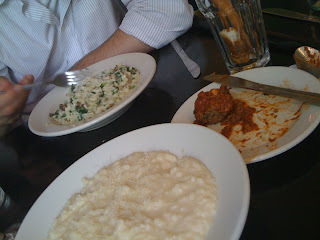 Shortly after, our risotto arrived. I love risotto and make it at home several times a year, but I’ve had it out a few times and two out of the three were terrible. Make that two out of four. I ordered the Monday special, four cheese, and it was creamy and delightfully al dente. Each spoonful stretched away from the bowl, creating long strings of gooey white cheese. 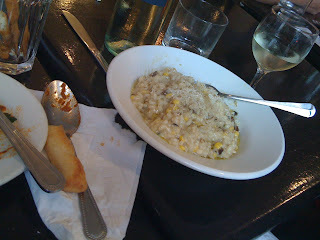 Carolyn ordered the risotto with porcini, sweet corn, and white truffle oil. Contrary to what one might expect, they definitely didn’t go shy on the truffle oil. You could clearly see it pooled atop the risotto in the nooks and crannies, creating a shiny yellow moat around the bowl. Need I even say how tasty this was? I didn’t try Chris’, but I imagine that it was good since he cleaned his bowl entirely. Carolyn and I ate until we felt like we would burst, and then had a few bites more, and brought the remnants of our dinners home. I must confess that I don’t normally do this, as doggy bags have a tendency to be forgotten in our fridge. I just knew this one wouldn’t stay untouched for long though. I feel like I should also take a moment to tell you about the freezer full of GF doughs, glass case of baked goods, and bags of pasta up front. Unfortunately, though, I cannot say much more than that it all exists and that I’m sure it’s delicious. I will take a more detailed survey on my next visit, that is of course if I’m not hopelessly fixated on the breadsticks and so stuffed that I’m practically rolling myself out again. Damn, it was good. And what became of my leftover risotto? I’m glad you asked. I made arancini. In Italian, this means “little oranges.” Usually, they’re balls of risotto that are breaded and deep fried. I stuffed mine with mozzarella and baked them. This is an excellent way to use up leftover risotto, or a good thing to keep in the back of your mind if you ever make it to Risotteria. It’s okay to stop when I’m full, there will be arancini in my future if I do. Set out three low, shallow dishes (bowls will also work fine). In one dish, put the rice flour. In the second, whisk together the eggwhites and water. Combine the bread crumbs and parmigiano reggiano in the third. Grab a small hunk of the risotto, about the size of a walnut. Flatten it out into a 2″ patty in the palm of your hand and place a piece of the mozzarella in the center. Wrap the risotto around the mozzarella; it will likely not cover the top of the cheese. Grab another, cherry-sized chunk of the risotto and use it to cover the rest of the mozzarella. Shape the risotto into a round ball, making sure that the cheese is covered well on all sides (the better covered it is, the less likely the arancini is to split and ooze while baking–though this isn’t necessarily a bad thing). This will make 6 risotto balls. One by one, roll each ball in the rice flour. Then coat with the egg white and give it an roll in the breadcrumb mixture, covering completely. Place on a baking sheet and bake for 10 minutes, or until the arancini are golden brown. These can be served alone or with marinara sauce for dipping–a fantastic appetizer alongside your favorite pasta dish. So, thanks again, Carolyn, for an amazing dinner and good luck on your latest adventure–I just know it will be great. And some time in the future, when you visit New York, you’ll have to stay with us so that we can go to Risotteria again and I can make arancini for you the next night from all of our leftovers. But not from Chris’, because he never has any.